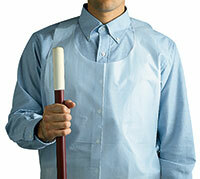 Save laundry costs and rental fees for cloth aprons. Economical protection for housekeeping, food service, and light- to medium-duty cleaning jobs. One size fits all; with linen finish, cutout neck, and attached extra-long waist ties. Meets FDA and USDA specifications for the packaging of food, meat, and poultry products.